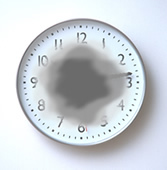 Although flashes and floaters are common, especially as we age, it is important to see your doctor if you experience them, as they may indicate a retinal tear or hole. Your doctor can distinguish between harmless flashes and floaters, and those that may require treatment for an underlying condition. Most flashes and floaters will become less noticeable with time as patients adjust their vision. Although these floaters are harmless, it is important to continue to receive regular eye exams to ensure that any permanent changes to your vision do not occur. 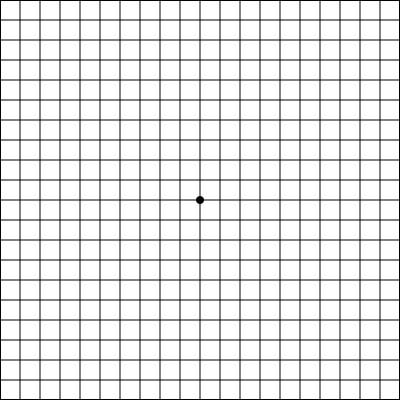 The Amsler Grid chart should be used to check the central part of your visual field, the area that can be damaged by Macular Degeneration. Notice if there are any areas within the grid that appear gray (or black), or if there are any areas where the straight lines appear bent, crooked, or missing. Check the chart regularly (daily or weekly). An epiretinal membrane, also known as a macular pucker, is a thin layer of scar tissue that forms over the macula, the area of the retina that gives us clear central vision. An epiretinal membrane often develops with age, as the vitreous gel that makes up most of the eye’s volume thins and pulls away from the retina. The damage caused to the retina leads to the formation of scar tissue on the retina. When the scar tissue contracts, the retina wrinkles, or puckers, causing blurry or distorted central vision. Patients with an epiretinal membrane may experience difficulty seeing fine details and reading small print, and may also see straight lines appearing as wavy. There may also be a gray area or blind spot in the center of your vision. 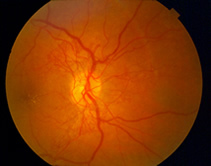 Although the cause of the conditions is similar, an epiretinal membrane is different from a macular hole. A macular hole is usually a much more serious condition that can progressively worsen. Most cases of epiretinal membranes do not progress and do not require treatment. The symptoms of distortion and blurriness are usually mild and patients are able to adjust to the vision changes without much impact on their daily lives. Noninvasive treatments such as eye drops or medications will not improve vision that is distorted from an epiretinal membrane. If vision distortion is severe enough, a vitrectomy may be performed to repair this condition.